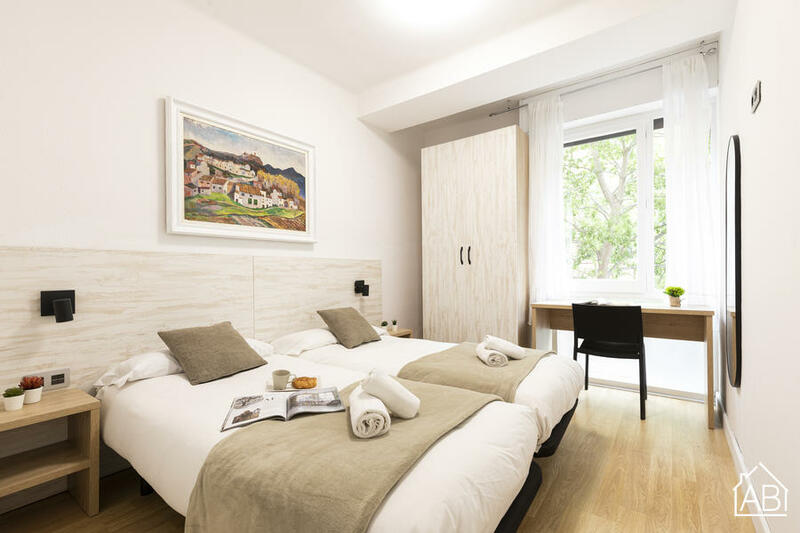 This lovely, three-bedroom apartment in Barcelona, situated in one of Barcelona´s most picturesque neighborhoods, Eixample, offers guests a warm and comfortable stay in Barcelona. The area is home to some of the finest restaurants, bars and cafés in the city, while still remaining in close proximity to the city center and all of the revered Barcelona sights. This apartment can accommodate up to six people. The apartment enjoys a modern, clean and fresh feel with a neutral color design, parquet flooring and large French windows throughout adding to the already spacious feel of this lovely locale. Brand new funishings have been recently added. The living room is furnished with a comfortable sofa, and a TV, perfect for unwinding after a day of sightseeing. Adjacent to the living area is the dining area, where you can enjoy a home-cooked meal, prepared in the fully equipped kitchen. All three bedrooms are furnished with two single beds each, which can easily be made into a double. The apartment has one bathroom fitted with a walk-in shower. This spacious and lovely Barcelona apartment, complete with heaters and air-conditioning, ensures a comfortable place to call home during your trip to the Catalan capital, any time of the year!